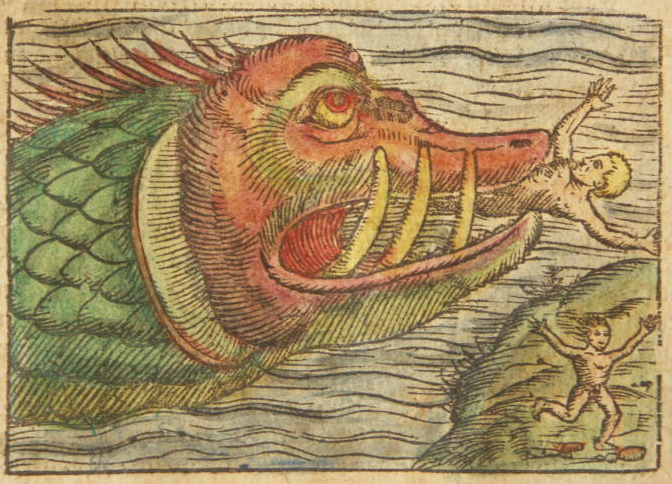 Isn’t curious how so many of the ocean-dwelling creatures were once depicted as sea monsters. Perhaps it was to create even more mystique among the explorers of the time. Or, maybe it was in hopes that people would not leave their own countries. Upon reading about man-eating creatures, who could blame people for being afraid to sail the world’s oceans. Among many cartographers of the period, German Sebastian Münster (1488 – 1552) added all sorts of creatures to his work. Munster’s sea monster, at least the one I’m sharing today, has a bit of a mysterious past. This fellow was dated by Columbia University to 1600. He wrote the first German-language description of the world – Cosmographia. It was first published in 1544 and became quite popular. It thrilled and fascinated people all over the world. There would be 40 editions of Cosmographia; printed in a number of different languages; including several that were released after his death. A number of famous artists including Hans Holbein the Younger, Hans Rudolph Manuel Deutsch, David Kandel and Urs Graf provided the woodcuts which were included in the work. While this is identified as Munster’s sea monster, I suspect it might be the work of Urs Graf. Graf’s signature runs along the coastline just under the beast’s chin. Urs Graf (1485-1528) was a Swiss Renaissance goldsmith, painter and printmaker. Regardless of who we credit this bloodthirsty creature to, he is over 400 years old. In this brightly colored drawing, we have a huge fish-like creature devouring one poor soul while another runs for his life. With blood red eyes and yellow fangs, almost as tall as a man, Munster’s sea monster would frighten even the heartiest of seaman. Green scales and yellow fills and fins make this colorful monster literally jump from the page.